I really love peaches and as you know Chilton County peaches are my absolute favorites. This is the second summer I’ve been back in Chicago and the first time in ten years that a Chilton County peach has not been in the fruit bowl, in the salad, ice cream, cobbler or my mouth. The Alabama vendor that packed and shipped them to arrive in perfect condition delivered the chilling news when I called to make the first of two to three summer orders. “I’m no longer shipping peaches.” Try as I might, I could not convince her otherwise. The Midwest has several varieties of pretty popular peaches —Red Havens, Loring, and Flamin’ Fury® #25 to name a few. They’ve had to fill-in for their Alabama cousins. 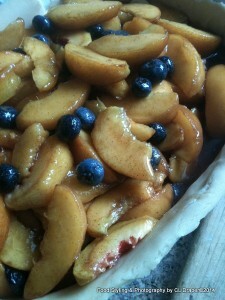 I paired Michigan peaches and blueberries for a fresh fruit cobbler to take to a Pasta & Peaches dinner. Now pasta was the main course and I was tasked with the dessert. The fruit cobbler was still a little warm when we cut into the crust, dishing it up as the juices oozed into the baking dish. The fruit may not have been from the South, but the cobbler inspired by my grandmother’s recipe and TLC was OMG good! Piping hot, we can’t wait for it to be cool enough to dish up! 2. Add ice water, 1 tablespoon at a time, until mixture is moist enough to shape into a ball, pulsing once after each addition. Divide mixture in half; shape each half into a ball. Wrap in wax paper or plastic food wrap and chill at least 2 hours. 1. Roll half of pastry dough between two sheets of wax paper to fit 11 3/4 x 7 1/2-inch baking dish. Remove top sheet of wax paper; invert pastry dough into baking dish Remove remaining sheet of wax paper. Gently fit dough into dish. Fruit mixture in prepared pastry crust in baking dish. 2. Preheat oven to 400°F. Combine 3/4 cup granulated sugar and next 3 ingredients in a small bowl. Gently stir together peaches, blueberries, lemon juice, and vanilla in a large bowl. Add sugar mixture, tossing gently to coat. 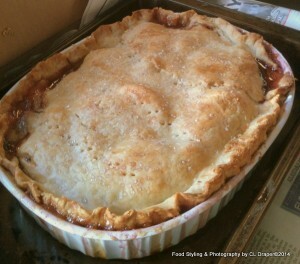 Place fruit mixture in prepared pastry crust in baking dish. Top filling with butter. 3. Roll remaining half of pastry dough to cover 11 3/4 x 7 1/2-inch baking dish between two sheets of wax paper; remove top sheet of wax paper. Invert pastry onto top of pie; remove remaining sheet of wax paper. 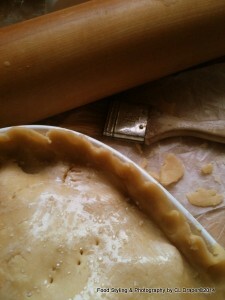 Trim off excess pastry along edges. Fold edges under and crimp to seal. Brush top of pastry with milk, and sprinkle evenly with remaining tablespoon granulated sugar. Using fork prick top crust for steam to escape. Pastry topped and ready to go into oven. 4. Place baking dish on a baking sheet or over aluminum foil in preheated oven, on second rack from bottom. Bake at 400°F, for 1 hour and 5 minutes to 1 hour and 15 minutes or until golden and bubbly, shielding edges with aluminum foil after 40 minutes to prevent excess browning. Remove to a wire rack, and let stand at least 45 minutes before serving. YIELD: 8 to 10 servings. *TIP: Three medium peaches equal about 1 lb.